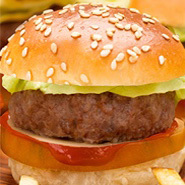 At Eurofrits we have the widest range of frozen products of the Chefburger variety: burger meat of beef and pork. Delicious beef meat. An XXL experience. Tender beef meat with a touch of bacon.